The Cherry Pickers depicts the artist's daughter, Julie Manet, standing on a ladder wearing a blue dress and ballet pumps. She has one arm outstretched above her head to pick the cherries. Below her, Morisot's niece Jeanne Gobillard is holding out a basket to catch the cherries and she wears a straw bower and her long hair is cascading down her back. The Cherry Pickers was created in 1891 at a time when the original Impressionists had become more accepted by the general public and art critics. The group was still meeting regularly as friends and colleagues and they continued to produce great artworks. Renoir and Berthe Morisot had become very close over the years and The Cherry Pickers was influenced by Renoir's more traditional style of panting. Although Morisot had moved on from using watercolors and was now experimenting with dry points and lithographs, though she was always constant in her style of painting in that she worked en plein air and her family and friends were the focus of her work. The Cherry Pickers was very popular at a Japanese exhibition in 1994 and can today be viewed in the Musée Marmottan Monet in France. Morisot was inspired to create The Cherry Pickers in a more lineal form than she had previously worked in by Pierre-Auguste Renoir. 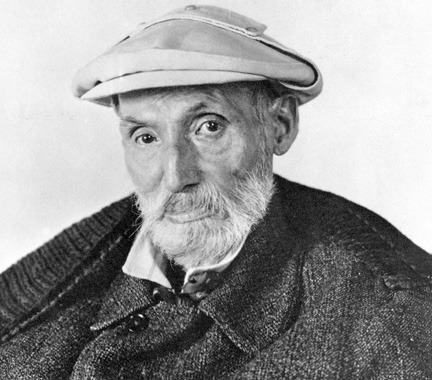 During the mid 1880s Renoir had become disillusioned by the Impressionist style of painting and had begun to work with more distinct shapes and forms. His paintings had taken on more defined brush work and were not as textured as the compositions he was creating in his earlier years. Although Morisot always worked in a consistently Impressionist style she painted Jeanne Gobillard and Julie Manet with well-defined forms that were uncharacteristic of her usual method. Morisot was also inspired to produce The Cherry Pickers because she painted her daughter throughout her career, until she died. 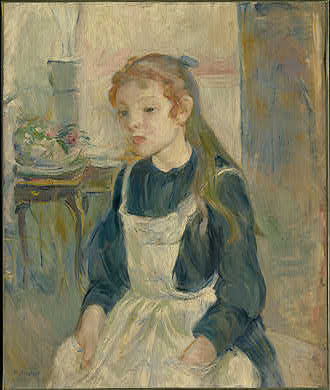 Therefore the painting biography of Julie Manet's life was a large portion of Morisot's oeuvre. Her subject matter was always highly appropriate for a woman painter and she enjoyed creating portraits of her beloved daughter. Julie Manet is in the background of The Cherry Pickers with her arm outstretched to pick the cherries and she stands on a ladder that dominates the right hand side of the image. Her face is obscured by her right arm and her hair is pulled back from her face. In front of Julie Manet Jeanne Gobillard captures the viewer's attention with her arms outstretched to collect the cherries. The cherry trees form the backdrop of the painting. Jeanne Gobillard is wearing a bright outfit that grabs the viewer's attention. The green hues of the skirt blend with bright whites and her belt matches her long, blond hair. Julie Manet's darker dress contrasts splendidly with Jeanne's clothing and the blue shades blended with the dark brown belt compliment the dark blue sky as well as Julie Manet's chestnut brown hair. The lighting of the painting focuses on Jeanne Gobillard and the bright white bow on her hat. The sunlight glistens from the bow and her cream shirt. Julie Manet is shaded by the cherry trees and the area around her feet is a midnight blue hue. This work was produced three years after The Cherry Pickers. Julie Manet is sat leaning on one hand and her hair is spilling over her shoulders. There is a halo of bright light around her and her skin is positively glowing. Her dress is a vivid white and there is a gold band pulling the dress in around her waist. Julie's dress has been painted in a similar manner to Jeanne Gobillard's in The Cherry Pickers. 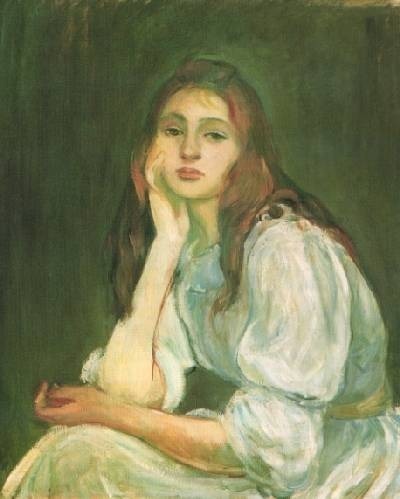 Morisot has used the same technique in both compositions to reflect the light from the dress and Julie's sleeve is stunningly white. 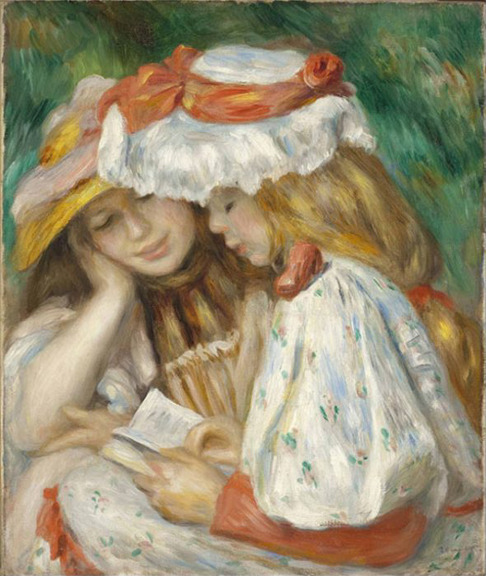 This piece shows two young girls reading from a small book. The two models are wearing fancy, brightly colored dresses and their hair is cascading down their backs. The model closest to the viewer has a bright red ribbon around her hat and the girl beside her is smiling fondly whilst being read to. The forms of the two girls are distinctly drawn and unlike some of Renoir's earlier Impressionist paintings, the shapes are clearly defined. 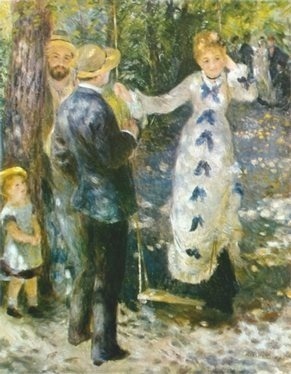 The Cherry Pickers may have been influenced by Renoir's painting because of the defined forms of the models. The two girls in Renoir's scene have the same clear outlines as Julie Manet and Jeanne Gobillard. Yet, whereas Pierre-Auguste Renoir's brush work is utterly concise, in The Cherry Pickers the trees in the background are painted in a thoroughly Impressionist style. Berthe Morisot was one of the most influential female artists of the nineteenth century. She worked with the Impressionists in Paris and was a central member of their controversial movement. Morisot created The Cherry Pickers toward the end of her career and a year before her first solo exhibition in 1892 when she was already a well-established artist. Morisot was good friends with her colleague Renoir in her later years and often held dinner parties for him and her other friends. She was influenced by his move away from Impressionism although she continued to work in a consistently Impressionist style. The Impressionist art movement arose in the nineteenth century in response to the Parisian art scenes' harsh rules about exhibiting work. 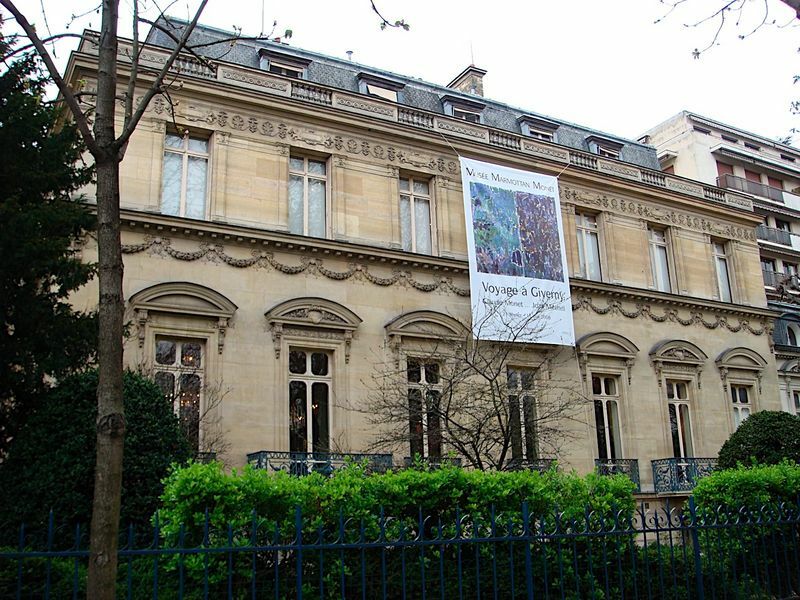 Alongside artists such as Monet, Pissarro and Cezanne, Berthe Morisot reacted against the status quo and showcased her work outside of the Salon. The work of the Impressionists was often ridiculed by critics. 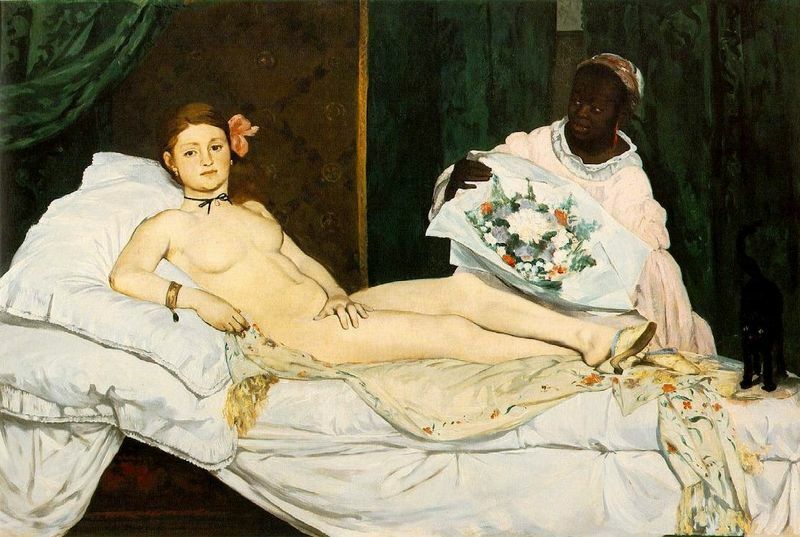 After the late 1880s newer, controversial artist techniques had replaced Impressionism and the mature Impressionists no longer held their own exhibitions. Paintings such as The Cherry Pickers were created and were highly valued by the general public. Many of the Impressionist artists moved away from this style of painting after the late 1880s but Morisot continued to work consistently in the Impressionist manner.